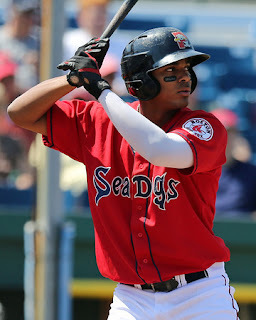 Top position prospect Xander Bogaerts (pictured) and top pitching prospect Matt Barnes headline the Portland Sea Dogs tentative 2013 opening day roster, which was released by the organization on Tuesday. Twenty-two of the 26 possible players slated to don the Sea Dogs jersey and take on the Trenton Thunder at Hadlock Field on Thursday, April 4 have Double-A experience, with twenty having previously played for the Sea Dogs. After being promoted to Portland from High A Salem in 2012, Bogaerts hit .326/.351/.598 in 97 plate appearances. The 20-year-old shortstop spent most of the spring playing for the Netherlands during the World Baseball Classic. Barnes pitched most of 2012 in Salem, where he averaged 8.8 K/9 while posting a 3.58 ERA in 93 innings. Joining Bogaerts and Barnes in Portland for Opening Day will be catcher Christian Vazquez, 2012 Red Sox Minor League Pitcher of the Year Brandon Workman, left-handed pitcher Drake Britton, and right-handers Anthony Ranaudo and Daniel Bard. Vazquez impressed with his defense behind the plate in major league camp this Spring, throwing out five of five attempted base stealers. The 22-year-old Puerto Rican hit .254/.344/.369 in 366 at-bats between Portland and Salem last year. Workman, 24, started five games in Portland in 2012 after spending the majority of the season in Salem. In 25 starts between both levels, Workman struck out 130 batters while only walking 25 in 138 innings pitched. Other notable players named to the Sea Dogs roster are infielders Travis Shaw, Kolbrin Vitek, and Tony Thomas. The 26-year-old Thomas, who spent the last two seasons as a second baseman for the PawSox, will apparently play outfield for the Sea Dogs, as the Red Sox currently have plenty of infield options in the upper minors. The team will need to make one roster move before Thursday to get down to the 25-man Eastern League limit. The full Sea Dogs roster can be found here. Kevin Boles returns for his third season as Sea Dogs Manager. He will be joined by pitching coach Bob Kipper, who is back for his sixth season, and new hitting coach and former Red Sox catcher Rich Gedman. Photo Credit: Xander Bogaerts by Kelly O'Connor.